Born in Salzburg, he showed prodigious ability from his earliest childhood. Already competent on keyboard and violin, he composed from the age of five and performed before European royalty. At 17, Mozart was engaged as a musician at the Salzburg court, but grew restless and traveled in search of a better position. While visiting Vienna in 1781, he was dismissed from his Salzburg position. He chose to stay in the capital, where he achieved fame but little financial security. During his final years in Vienna, he composed many of his best-known symphonies, concertos, and operas, and portions of the Requiem, which was largely unfinished at the time of his death. The circumstances of his early death have been much mythologized. He was survived by his wife Constanze and two sons. 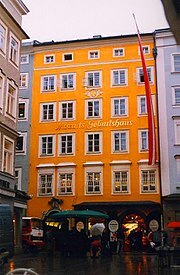 Wolfgang Amadeus Mozart was born on 27January 1756 to Leopold Mozart (1719–1787) and Anna Maria, née Pertl (1720–1778), at 9 Getreidegasse in Salzburg. This was the capital of the Archbishopric of Salzburg, an ecclesiastic principality in what is now Austria, then part of the Holy Roman Empire. He was the youngest of seven children, five of whom died in infancy. His elder sister was Maria Anna Mozart (1751–1829), nicknamed "Nannerl". 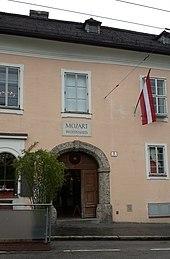 Mozart was baptized the day after his birth, at St. Rupert's Cathedral in Salzburg. The baptismal record gives his name in Latinized form, as Joannes Chrysostomus Wolfgangus Theophilus Mozart. 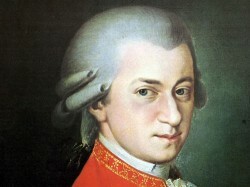 He generally called himself "Wolfgang Amadè Mozart" as an adult, but his name had many variants. In his early years, Wolfgang's father was his only teacher. Along with music, he taught his children languages and academic subjects.Solomon notes that, while Leopold was a devoted teacher to his children, there is evidence that Mozart was keen to progress beyond what he was taught. His first ink-spattered composition and his precocious efforts with the violin were of his own initiative, and came as a surprise to Leopold, who eventually gave up composing when his son's musical talents became evident. 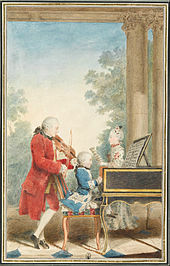 While Wolfgang was young, his family made several European journeys in which he and Nannerl performed as child prodigies. These began with an exhibition in 1762 at the court of Prince-elector Maximilian III of Bavaria in Munich, and at the Imperial Courts in Vienna and Prague. A long concert tour followed, spanning three and a half years, taking the family to the courts of Munich, Mannheim, Paris, London, The Hague, again to Paris, and back home via Zurich, Donaueschingen, and Munich. During this trip, Wolfgang met a number of musicians and acquainted himself with the works of other composers. A particularly important influence was Johann Christian Bach, whom he visited in London in 1764 and 1765. The family again went to Vienna in late 1767 and remained there until December 1768. The family trips were often difficult, and travel conditions were primitive. They had to wait for invitations and reimbursement from the nobility, and they endured long, near-fatal illnesses far from home: first Leopold (London, summer 1764), then both children (The Hague, autumn 1765). In Milan, Mozart wrote the opera Mitridate, re di Ponto (1770), which was performed with success. This led to further opera commissions. He returned with his father twice to Milan (August – December 1771; October 1772 – March 1773) for the composition and premieres of Ascanio in Alba (1771) and Lucio Silla (1772). Leopold hoped that these visits would result in a professional appointment for his son, and indeed ruling Archduke Ferdinand contemplated hiring Mozart but owing to his mother Empress Maria Theresa's reluctance to employ "useless people", the matter was dropped and Leopold's hopes were never realized. 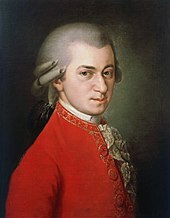 After finally returning with his father from Italy on 13 March 1773, Mozart was employed as a court musician by the ruler of Salzburg, Prince-Archbishop Hieronymus Colloredo. The composer had a great number of friends and admirers in Salzburg and had the opportunity to work in many genres, including symphonies, sonatas, string quartets, masses, serenades, and a few minor operas. Between April and December 1775, Mozart developed an enthusiasm for violin concertos, producing a series of five (the only ones he ever wrote), which steadily increased in their musical sophistication. The last three—K. 216, K. 218, K. 219—are now staples of the repertoire. In 1776, he turned his efforts to piano concertos, culminating in the E-flat concerto K. 271 of early 1777, considered by critics to be a breakthrough work. In the same letter to his father just quoted, Mozart outlined his plans to participate as a soloist in the concerts of the Tonkünstler-Societät, a prominent benefit concert series;this plan as well came to pass after the local nobility prevailed on Colloredo to drop his opposition. The courtship did not go entirely smoothly; surviving correspondence indicates that Mozart and Constanze briefly separated in April 1782.Mozart faced a very difficult task in getting his father's permission for the marriage. The couple were finally married on 4 August 1782 in St. Stephen's Cathedral, the day before his father's consent arrived in the mail. Despite the great success of Die Entführung aus dem Serail, Mozart did little operatic writing for the next four years, producing only two unfinished works and the one-act Der Schauspieldirektor. He focused instead on his career as a piano soloist and writer of concertos. Around the end of 1785, Mozart moved away from keyboard writing[page needed]and began his famous operatic collaboration with the librettist Lorenzo Da Ponte. 1786 saw the successful premiere of The Marriage of Figaro in Vienna. Its reception in Prague later in the year was even warmer, and this led to a second collaboration with Da Ponte: the opera Don Giovanni, which premiered in October 1787 to acclaim in Prague, but less success in Vienna in 1788. The two are among Mozart's most important works and are mainstays of the operatic repertoire today, though at their premieres their musical complexity caused difficulty for both listeners and performers. These developments were not witnessed by Mozart's father, who had died on 28 May 1787. The cause of Mozart's death cannot be known with certainty. The official record has it as hitziges Frieselfieber ("severe miliary fever", referring to a rash that looks like millet seeds), more a description of the symptoms than a diagnosis. Researchers have posited at least 118 causes of death, including acute rheumatic fever, streptococcal infection, trichinosis, influenza, mercury poisoning, and a rare kidney ailment. He enjoyed billiards and dancing, and kept pets: a canary, a starling, a dog, and a horse for recreational riding. 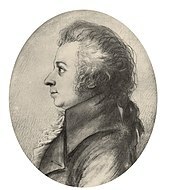 He had a startling fondness for scatological humor, which is preserved in his surviving letters, notably those written to his cousin Maria Anna Thekla Mozart around 1777–1778, and in his correspondence with his sister and parents.Mozart also wrote scatological music, a series of canons that he sang with his friends. 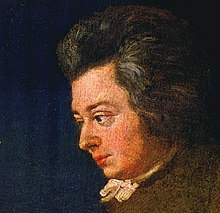 During his last decade, Mozart exploited chromatic harmony, for instance in his his String Quartet in C Major, K 465 (the Dissonance Quartet; 1785), with an introduction containing chromatic suspensions and harmony reminisicient of composer Richard Wagner, whose musicial career post-dates Mozart's death by over 40 years.